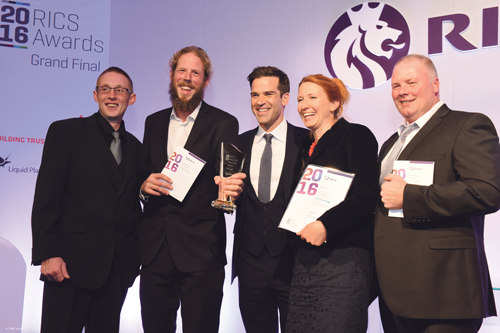 Redland Road company, Brownfield Green, has won a national award from the Royal Institute of Chartered Surveyors (RICS) for the best UK residential development. The company specialises in church conversions and the adaptation of historic buildings, and was the developer behind Kersteman Quarter, transforming the Redland chapel into new homes. The award is for the redevelopment of Romilly Quarter, in the Welsh seaside town of Barry, turning a converted Grade II Listed Victorian Methodist Church and Sunday School Hall into 11 unique town houses with original features. Brownfield Green was set-up to develop brownfield sites in Bristol and the surrounding area. The company has a design led ethos and aims to provide homes that are styled in an individual and contemporary way, incorporating good environmental design as standard. Their current project is the conversion a Georgian country house, Triley Court, in the Brecon Beacons. Company director, Alex Fawcett, said: "We're so pleased to have won this award. It's great that the judges recognised that there's a place for traditional craftsmanship and materials in modern construction. "We're a niche company based in Redland so to have national exposure like this is not exactly what we're used to! We feel very proud that all our hard work in making Romilly Quarter a success has been recognised by the judges.